Wizard World, in conjunction with the Madison Reading Project, is requesting comics/graphic novel donations from fans at this weekend's Wizard World Madison. MADISON, Wis. - Nov. 27, 2018 - PRLog -- Wizard World is proud to team with the Madison Reading Project to help put comic books, graphic novels and other reading material in the hands of underserved children in South Central Wisconsin. 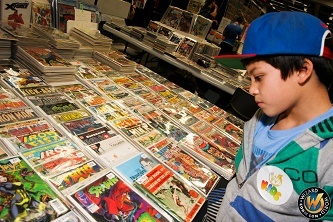 Wizard World is asking fans to bring child-appropriate graphic novels, comics, science fiction books, or any other similar materials to Wizard World Madison this weekend and leave them in a specially marked donation receptacle near the Special Guest Registration desk. As a Thank You, fans who donate two or more items to the Madison Reading Project during Wizard World Madison will receive a free pre-autographed celebrity photo from a selection of previous Wizard World guests. These photographs are available to fans on a first-come, first-served basis whil supply lasts, one per family donation per day, at the full discretion of Wizard World. Fans can learn more about the Madison Reading Project at https://www.madisonreadingproject.com/. Wizard World Madison is also the place for cosplay, with fans young and old showing off their best costumes throughout the event. Fans dressed as every imaginable character – and some never before dreamed – will roam the convention floor and participate in the famed Wizard World Costume Contest on Saturday evening. For more on the 2018 Wizard World Madison, visit http://www.wizardworld.com/comiccon/madison.